The value of the card must be one greater or one less than the card you drop on it. If no drops are left then click on the "flip cards" button to swap the cards around. The faster you play, the more points you will get. Use YOUR MOUSE to control all aspects of the game. 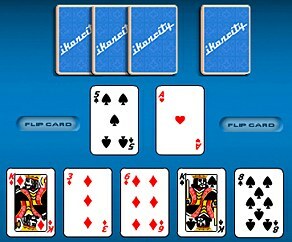 Your goal in this fact online game of cards is to get rid of all your cards before the computer does by placing your cards on one of the two middle piles.